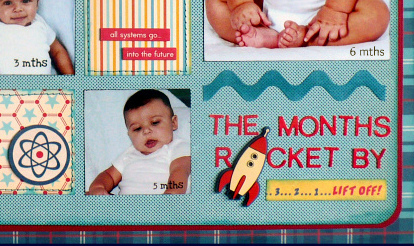 Long before I had a child or started scrapbooking, I saw a baby project on the Martha Stewart show that stuck with me. 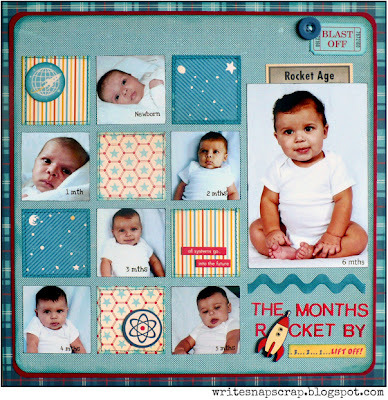 A crafter – and new momma – had taken a photo of her baby every month on his birthdate in a plain white onesie. Then at the end of his first year, she made a photo collage of the 12 photos and framed it. I loved this idea and decided to follow suit when my son was born. I went to the store and bought a Carter’s plain white onesie, size L, which fits babies up to 20 lbs. Wow, that onesie looked gigantic and it was hard to believe my little sweetpea could grow into it in one year’s time. But he did! And so I set about photographing my son each month in the onesie. For his newborn pic and 1 month pic, he’s wearing a long-sleeve onesie because he just looked ridiculous in the size L onesie. But after that, I faithfully took his photo each month in the same onesie. I still haven’t made a photo collage of all 12 months. But I did make a layout of the photos from the first six months. I used October Afternoon’s Rocket Age for this layout. Although Rocket Age is not a baby line, the theme of time rocketing by worked perfectly. I reduced the size of each photo so I could punch it in a square. I also punched squares of patterned paper and stitched them to the page for a quilted look, then added some space-themed embellishments, including a rubber charm to stand in for the "o" in rocket. 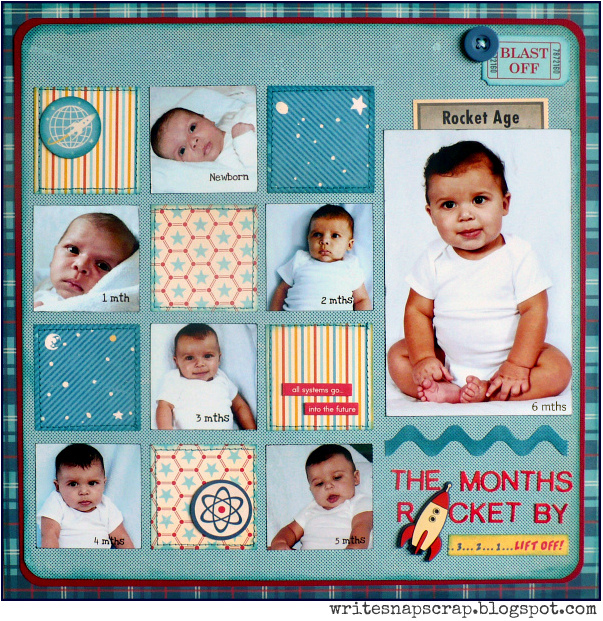 This layout was published in the April 2012 issue of Scrapbooks Etc and is reposted with permission. This is so cute!! Love the design and line!! What a great idea!! I loveeeeeeeeeeee this!! LOVING the photos, the grid design and loving the rocket as the 'o'!!! Just BEAUTIFUL!!! What a GREAT idea! LOVE this layout and your photos! Great showcase for the OA collection too- so many great details! Congrats! Love how you used the rocket theme for this! Too cute! This is so adorable! Great job keeping up on taking those photos every month. That's a great idea! Oh Izzy, I adore this layout! The little grid design on the left side and the cute photos! It really is stunning! so adoarble and what a cool design!!! Love the grid !!! and what super cute pics!!! What a DARLING idea! LOVE this! Adorable photos and a great idea! The OA paper looks perfect! Definitely worthy of publication. Congrats on the pub! Adorable layout! Great design! What an adorable layout!! And congrats on being published! What a great idea!! Such adorable photos and layout! I was stumped as to how I would use this paper which is why I didn't buy it. I love your idea of the months 'rocketing' by. So cute! Congrats on being published! I think that's the only month that I didn't get this year so far. What a handsome little boy, too. :) And I really love how you used the rocket theme for this! This is sooo cute! Wish I would have done something like this with my babies! this could not be more amazing! I love the idea and the design!!!! Oh, what a fabulous idea!! It's almost enough to make me want to have another baby. Almost. The perfect paper collection for this gorgeous layout! You rocked this page, Izzy! I love that idea of taking his picture every month in just a onesie! He is an amazing baby and you are lucky to have each other! TFS this one with us! This is so beautiful. I love the title and how you tied it all in. Great photos, great idea. I saw this in the magazine and I knew right away that you had made it! I the page out and it's in my inspiration binder now. LOL Congrats on your publication Izzy. This page is AWESOME. Congrats on getting published! I love the rocket theme, it's so fitting! Thanks for stopping by my blog! Oh wow this is amazing and theme is so cute. What an amazing idea to scrap the memories. I love it! Oh I am so in love with this! CUTE little photos. This is brilliant! What a great idea! Love the cute layout...boy pages just pull at my heart strings! ;-) Such a cutie he is!